KPBSD school calendar dates, what do you think? What do you think about school start dates, holidays, and inservice days? 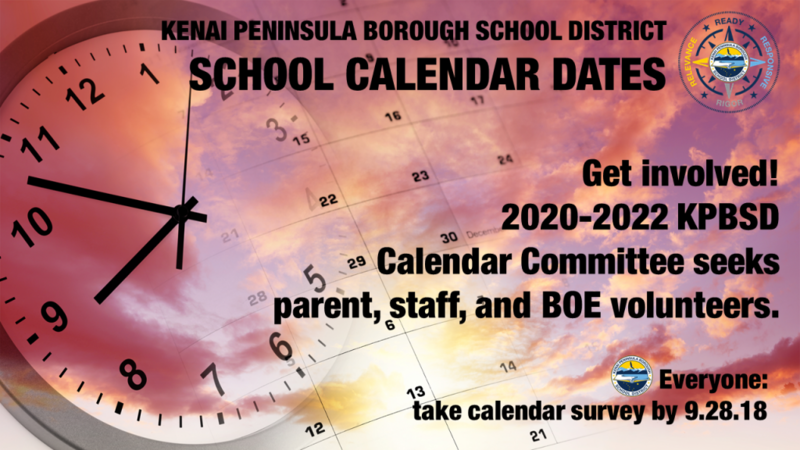 Will you serve on a committee to set a future KPBSD school calendar? Everyone: kindly provide your thoughts about the school start date, holidays, and inservice days. The calendar committee reviews the 2019-2020 calendar and makes recommendations to the school board for the 2020-2021 and 2021-2022 school calendars. WHEN: The meetings will be October 9, and October 16 (if needed) at the District Office in Soldotna, Alaska. Details and the 2018 Calendar Committee Application are online at Calendar Committee or contact Natalie Bates at 907-714-8858. Return your application to NBates@kpbsd.k12.ak.us or fax to 907-262-5867 by October 1, 2018. This entry was posted on September 20, 2018 at 2:10 pm. You can follow any responses to this entry through the RSS 2.0 feed. You can leave a response, or trackback from your own site.